Roman Chamomile - chamaemelum nobile) (Traditionally used as a ground cover in Europe. Lacy green leaves have a pleasant apple-like scent. 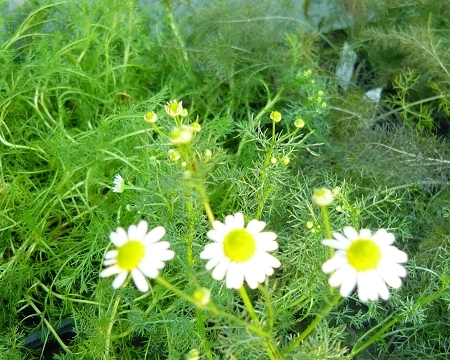 Chamomile Tea is popularly made from the small white daisy flowers. prefers cool weather and will require shade during hottest summer months. Perennial zones 5-9. Live starter plant in 3 inch container.